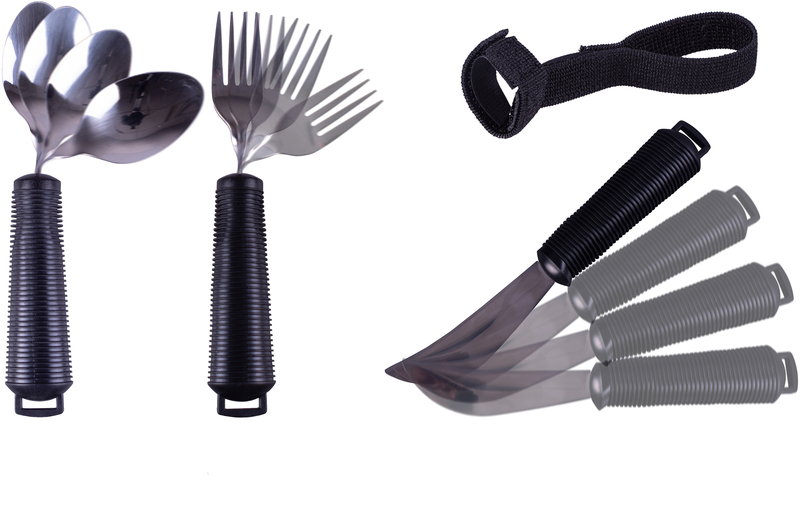 Dining aid set including a bendable spoon and bendable fork together with a rocker knife and 3 utensil straps. A Dining Aid Set consisting of a bendable spoon and bendable fork and a rocker knife, together with 3 utensil straps. 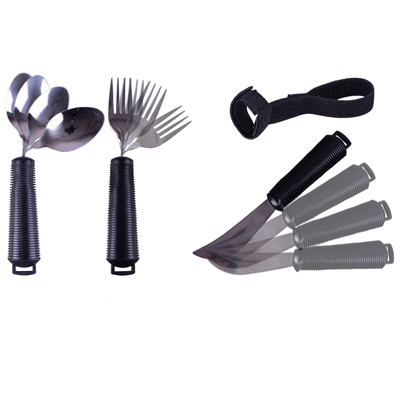 The bendable spook and fork and rocker knife all have a fixed loop at the end of the wide, soft cushion handle, through which the utensil strap can be passed to secure the dining aid utensil to the user's hand. Staff Review: Sometimes the little things make all the difference. Whether you're buying as a gift or for yourself, you'll be suitably impressed with this cleverly-designed cutlery set. 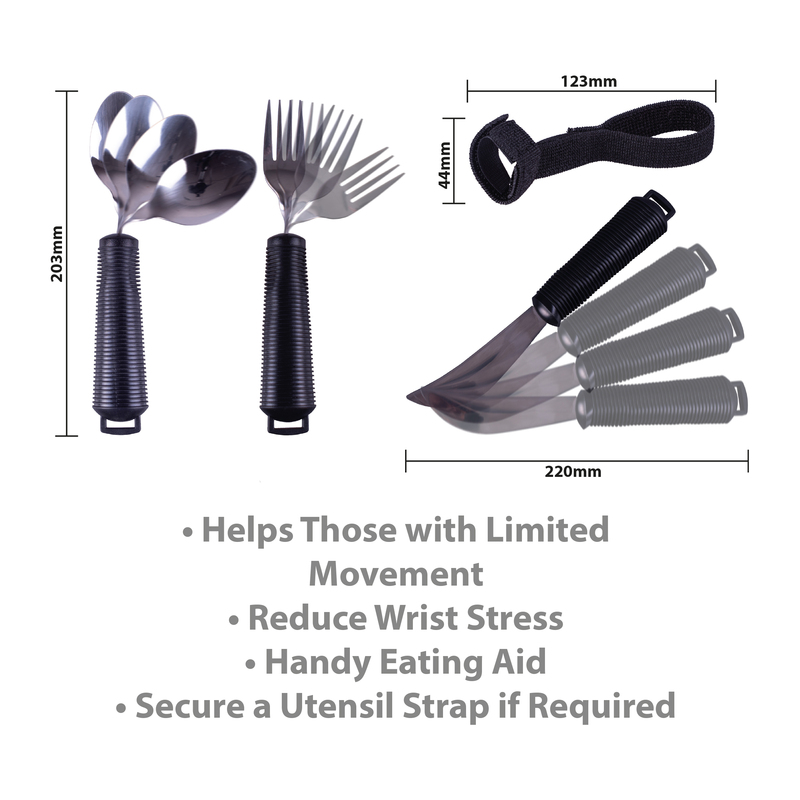 We were surprised by how easy to use we found the Bendable Cutlery Set, it really is an ideal kitchen aid, particularly for users who may have weakness in the hands or arms due to arthritis or similar conditions, which can make it extremely difficult to grip a standard knife and fork. The cushioned handles are wider and ergonomically shaped to fit into the hand in a very natural, comfortable way. The bendable head of the spoon and fork can be positioned to the most comfortable angle, while the rocker knife is an ingenious utensil to cut food without the awkward and sometimes painful forward/backward motion; you simply move the blade of the knife through the food with a small rocking motion, making it much less likely to slip and cause spillage or injury. We were initially unsure about the utensil strap, but it proved to be very easy to use and offers an extra level of security. 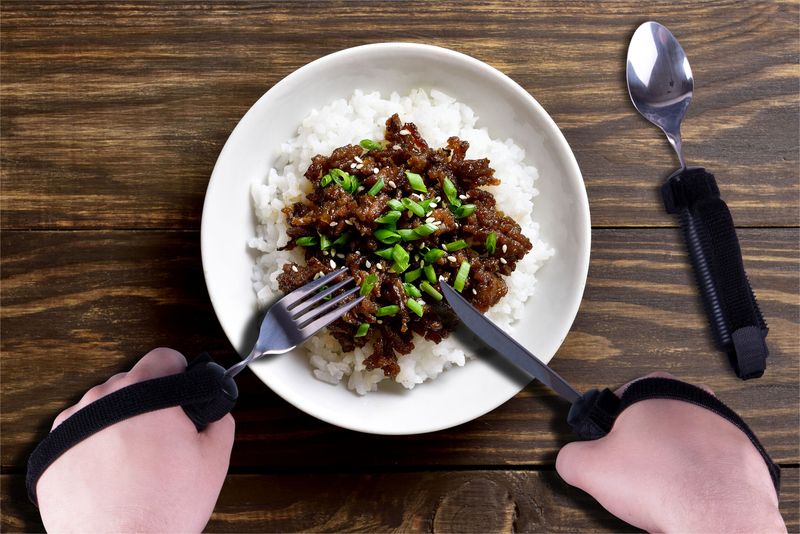 This clever device passes through the loop on the utensil, then fixes around the user's hand to ensure that even the lightest of grips keeps the utensil in position. We highly recommend this set; it's a clever little kitchen aid that could make a huge difference to users who need help with independent dining.